The travel plans of many divers look something like this: Get off the plane and get transported to a resort or live-aboard dive boat and dive for several days. Get transported to the airport. Fly home. Even though most of my travel these days is centered on diving, I try to build in a few extra days to see and experience the country I’m diving in. In the December 2015 issue, I addressed mission-specific diving revolving around critters. This time I’ll explore finding unusual experiences, both underwater and topside. Last year my wife, Karen Straus, signed up for a birding trip to Iceland. I’m not into birds, but had read about the natural splendor of the country and its waterfalls, volcanoes and the rugged beauty of its countryside. What intrigued me most was the opportunity to dive Silfra Crack. Iceland is astride the North American and Eurasian tectonic plates. 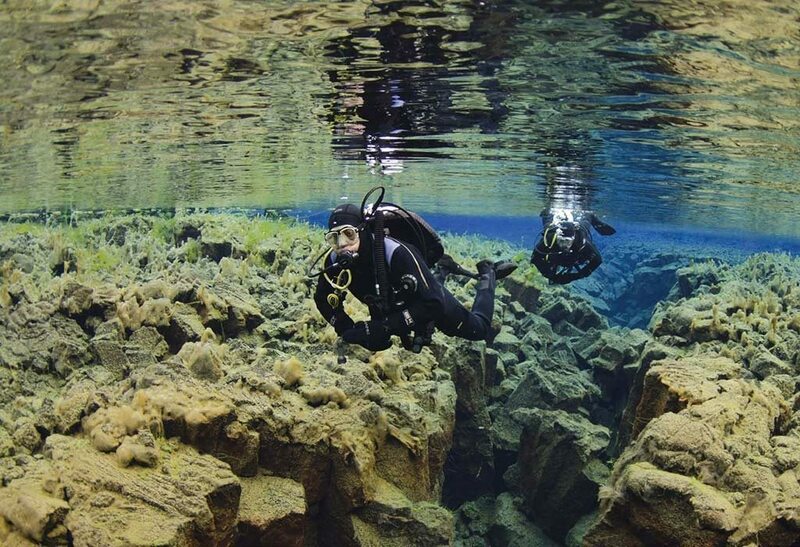 The gap runs through Thingvellir Lake, an underwater canyon so narrow that at one point you can touch both continents within the span of your arms. We decided to arrive three days ahead of the group so we could dive Silfra, along with Kleifarvatn Lake, which features bubbling volcanic activity. It wasn’t as easy as signing up with a travel agency. Internet research and email correspondence allowed us to hook up with a dive operator whose services included transportation and gear rental. We decided against schlepping full gear for three days of diving on a 12-day trip. Instead we took masks, computers and underwater camera housings, leaving the rest at home. Because the water temperature is 35 degrees Fahrenheit (2 degrees Celsius), the dive operators are well-equipped for cold water. They supply dry suits and warm underwear, regulators that perform in near-freezing conditions, and lots of weight. The dive was enchanting, in the clearest water I’d ever seen, an easy three-dimensional tour through a winding, narrow, rocky canyon. In this case, a three-day diving interlude made a land-based trip more interesting. Tacking on some diving to a land-based trip is unusual. For most divers it’s the other way around. After all, if you travel as far as diving takes you, it would be a shame not to see the country and experience its natural and cultural history. By the same token, there are some dive destinations that stand alone as “bucket list” experiences. Let’s look at both, beginning underwater. It wasn’t as easy as signing up with a travel agency. Internet research and email correspondence allowed us to hook up with a dive operator whose services included transportation and gear rental. We decided against schlepping full gear for three days of diving on a 12-day trip. Instead we took masks, computers and underwater camera housings, leaving the rest at home. Because the water temperature is 35 degrees Fahrenheit (2 degrees Celsius), the dive operators are well-equipped for cold water. They supply dry suits and warm underwear, regulators that perform in near-freezing conditions, and lots of weight. If you aren’t blessed with clear water in your backyard, you can go find it on vacation trips. When rainwater is filtered through many layers of limestone, visibility can exceed 300 feet (91 m). That’s the case of the cenotes in Mexico’s Yucatan. A cenote is a sinkhole, where a part of the ceiling has collapsed, leading to an underground pool of fresh water. Some cenotes are the openings of vast underground cave systems many miles long. Cave training and certification are required to enter the cave area, but any Open Water diver may dive the cavern with a guide. The difference is that in a cavern you can see daylight and are within 200 feet (61 m) of the opening. Marking the boundary are signs with skull and crossbones, emblazoned with dire warnings like, “Prevent your death. Do not go beyond this point unless cave certified.” But it’s still possible to get a taste of what cave divers experience. There are areas in some caverns with dramatic stalactites and stalagmites, in semidarkness, lit only by your torch. Looking back, you still can see the reassuring blue glow of the entrance in the distance. Sometimes there is a halocline, where salt and fresh water meet and everything gets blurry. Several years ago I wrote a diver’s guidebook to Micronesia. I spent three summers traveling among the islands, diving and exploring their history and culture. One of my primary missions was following the path of World War II across the Pacific. 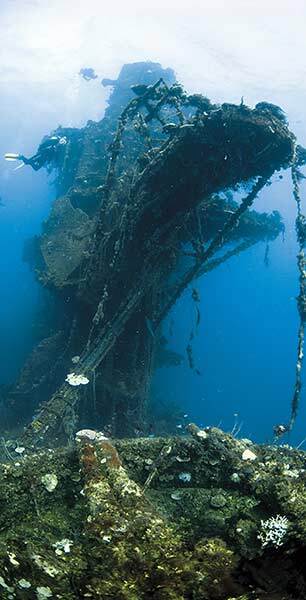 Every diver knows about the wrecks of Truk Lagoon, now called Chuuk. But Palau has actually more wartime shipwrecks. The difference is that most of the Palau wrecks have been stripped, whereas the Chuuk wrecks feature preserved artifacts ranging from bullets to helmets to cookware. On land, rusting tanks and guns and remains of aircraft still lie in the jungles of Pohnpei, Yap and the Marshall Islands. At Tinian in the Northern Marianas, abandoned airstrips and atomic bomb pits are stark reminders of Hiroshima and Nagasaki. Majuro in the Marshall Islands has a site called The Parking Lot, where World War II Jeeps, half-tracks, and deuce-and-a-half-trucks stand on the bottom in about 40 feet (12 m) of water. They were loaded on a barge and pushed overboard when GIs left the island. The wreck of the Saratoga rests in about 170 feet of water off Bikini Atoll. Perhaps the most unusual World War II dives are at Bikini Atoll, site of atomic bomb tests from 1946 into the late 1950s. Nineteen ships lie on the bottom, the only ones ever sunk by nuclear bombs. They are no longer radioactive, but the bottom is 170 feet (52 m) down, making this borderline technical diving. Typical dives are 35 minutes, followed by an hour of decompression with the 30-, 20- and 10-foot (9, 6 and 3 m) stops on surface-supplied 75 percent oxygen mix. Why go to all that trouble to dive on 70-year-old junk? These are warships, many with significant histories. The aircraft carrier Saratoga was Admiral Bull Halsey’s flagship in World War II. Live bombs and ammunition are on the hangar deck, along with Helldiver and Avenger fighter bombers. The Nagato was the battleship from which Admiral Yamamoto gave the order to attack Pearl Harbor. Imagine swimming in Halsey’s stateroom or along the bridge where Yamamoto stood. The vast majority of diveable World War II wrecks in other locations are tankers and freighters. Among Bikini’s wrecks are submarines, destroyers, battleships and heavy cruisers. For 10 years the atoll was home to a land-based dive operation, owned by the people of Bikini and subsidized by proceeds from reparations by the U.S. government. It closed in 2006, hit by the double whammy of the worldwide financial crisis and the grounding of the only airplane serving the island. Today at least one live-aboard, based in Kwajalein, makes several trips a year to Bikini. World War II wrecks may also be found in Papua New Guinea, the Philippines, Vanuatu, Scotland, Hawaii, and off the Atlantic coast of the United States. It’s been 70 years since the war ended, and all the ships are slowly becoming part of the sea. Structures on many of them have collapsed; some are no longer safe to dive. If you are into history, go see them before it’s too late. Before leaving Micronesia, let’s look at some unusual dives in Palau. This island nation is renowned for its wide range of underwater experiences. Jellyfish Lake is in the middle of an island, where mastigias jellyfishes have been isolated for eons. With no natural predators, they have lost their ability to sting. Thousands of them populate the clear waters of the lake. Chandelier Cave is a shallow cave with clear water, stunning rock formations, and an air pocket at the top. Like many caves, there is a layer of fresh water on top of the salt water, with a dramatic, blurry halocline between them. Blue Hole is a cavern system starting near the surface and dropping to an exit point more than 100 feet (30 m) down. When the current runs at Blue Corner, divers use reef hooks to hold their position while viewing the parade of sharks and pelagics swimming by. Finally, the boat ride through the exquisite Rock Islands is like a fantasy journey through a labyrinth of tiny, mushroom-shaped jungle islands. New Zealand is one of the most beautiful countries in the world. It features several unusual dives, but the most memorable for me was in Milford Sound. Several years earlier, I had hiked the Milford Track. This time my mission was to dive it. Located near the southern end of South Island, and fringed by mountains rising directly from the water, it’s one of the rainiest places on Earth. A freshwater lens lies on top of the salt water, to a depth of 10-15 feet (3-4.5 m). Sea stars gather at the boundary like a living bathtub ring. The water is dark, cold, and visibility is poor. So why dive there? Black coral and basket stars, usually found in deeper waters, are found shallow in the sound. But the most mesmerizing part of the dive was reaching the surface after having spent 45 minutes in gloom. Every mountain, shrouded in misty clouds, had about a dozen waterfalls spilling into the fjord. The rain and the darkness added to the ethereal feeling of the most dramatic scene that ever greeted me at the end of a dive. On another day, at Poor Knights off North Island, I encountered one of the strangest creatures I’d ever seen: a gigantic pink tube, more than 20 feet (6 m) long, drifting in the water column. It was a pyrosoma, a colonial tunicate made up of thousands of individual organisms. Pyrosomas usually range from 6 inches to 2-3 feet (15 cm to 0.6-0.9 m). To prove this wasn’t a diver’s exaggeration, I shot some video of Karen, hovering next to the creature. It was at least six times as long as she is. Current drifts sometimes seem like an underwater roller coaster ride. If you like riding currents, look for the big ones. The most intense I’ve ever experienced was Tiputa Pass in Rangiroa, French Polynesia. The dive begins outside the lagoon on an incoming tide. As the water rushes through the narrow pass, its speed reaches about 7 knots (8 mph). To put that in perspective, Olympic sprint swimmers top out at about 4.3 knots (4.95 mph) for short distances. When I tried kicking against it, I was still moving backward. Even gray reef sharks had to work swimming upcurrent. But when they were riding with it, those torpedoes with teeth kept flashing past us. About halfway along the drift is a shallow cavern that affords a respite from the ride. Although I spotted it a long way off and veered in that direction, the current almost swept me past. I barely grabbed the far edge and pulled myself in. To my surprise, three or four sharks were sharing the shelter. It seemed they needed a breather too. Another high-current area is Alaska’s Inside Passage. The current not only runs back and forth, but also up and down. Skippers call it The Swirlies, and always try to time their dives at slack tide. But tide tables aren’t always totally accurate, and I’ve occasionally been tossed around like laundry in a washing machine. The positive side is that the current brings nutrients to the invertebrates along the walls, making this cold-water area as colorful as any coral reef. Currents are gentler in Indonesia’s Komodo National Park, but nearly every dive is a drift. Part of the reason is that this is where the Pacific and Indian oceans merge, resulting in a diversity of creatures from Australia and Asia. It seems every reef is surrounded by thousands of orange anthias, while the high-current areas carry nutrients to everything from corals to mantas. 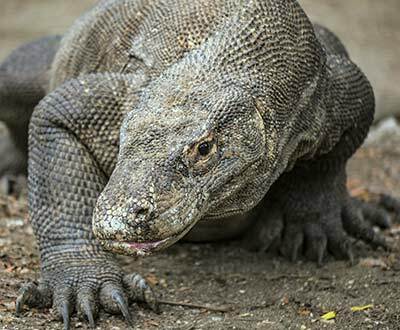 It’s also home to the world’s largest lizard, the Komodo monitor. These relics of the dinosaur age always hang around park headquarters but may also be encountered in the wild along the sandy beaches of certain islands. They can be aggressive and their bite is venomous, so guides carry forked sticks to keep them at a respectable distance from tourists. Indonesia’s Komodo National Park offers exceptional diving — and a chance to view the world’s largest lizard, the Komodo dragon. Some dive areas are located in countries with distinctive cultures or landmarks that would be a shame to miss. Others offer unusual experiences nearby that are worth taking advantage of when you are in the neighborhood. If your mission is to combine topside experiences with diving, here are some suggestions. Let’s begin with the Galapagos. Avid divers are very familiar with the underwater attractions, which can range from sea lions and sharks to penguins and marine iguanas. On land there are magnificent vistas ranging from lava fields to cloud forests to rugged coastlines. Birds, reptiles and mammals are so habituated to human presence that they carry on their natural behaviors like mating, nesting and eating as if we aren’t there. These days, Ecuadorian rules limit dive boat passengers to minimal land excursions. Additionally, a one-week trip that requires long transits to Darwin and Wolf islands, where the hammerhead schools and whale sharks are, doesn’t allow much time to explore the central and southern islands. So if you have the time and inclination, it would be worthwhile to book an extra week on a hiking and snorkeling boat to see the albatrosses, boobies, frigate birds, penguins and iguanas. The latter two are best approached on snorkels anyway. Ecuador is the jumping-off point for other land-based adventures as well. You can take a narrow-gauge train into Andean villages for spectacular mountain scenery and village markets. In neighboring Peru, the mysterious lost city of the Incas, Machu Picchu, stands atop a mountain overlooking the Urubamba River. You can get there by hiking the Inca Trail for several days. We took the easy way: a train from Cusco and a bus up the switchbacks to the mountaintop. Or how about a flight to Iquitos, then board a riverboat on the Amazon? Along the way, we hiked in the jungle looking for sloths and caimans, and waded in opaque, brown water looking for pink dolphins. They were frolicking on the surface no more than 20 feet (6 m) away, but 5-inch (13 cm) visibility doesn’t cut it for underwater photography. The skipper told us there was nothing to fear from piranhas. He must have been right, because we’re still here. As far back as the 1980s, many Americans were fearful about traveling to the Red Sea, although Egyptians were more likely to kill them with kindness, as they are among the most hospitable people on the planet. The dramatic contrast between the clear, blue waters of the Red Sea, splashed with blazing primary colors of fish and invertebrates, and the stark, monochromatic desert and mountains makes a lasting impression. One of my most memorable trips was a camel safari out of Dahab on the Sinai Peninsula. For three days the camels carried us, scuba and camping gear, food, and our Bedouin guides. It wasn’t just that camels were a more romantic way to travel. Some of the single tracks between the mountains and the sea were too narrow even for a Jeep. Camels were the only way to get there. The reward was diving some pristine reefs that hadn’t been subjected to the heavy diver traffic of the more popular Red Sea sites. Another reward was experiencing the solitude and majesty of the Sinai. In the evening, we would gaze at thousands of stars while partaking of flatbread and fuul, a traditional feast of the Bedouins. Truth be told, we were totally dependent on them for survival. One afternoon while resting in a wool tent, we were literally roasting until one of the guides pulled up a back corner and let the wind through. The temperature inside immediately dropped about 10 degrees. In addition to marine life, the Red Sea is a wreck diver’s nirvana. The best-known ship is the Thistlegorm, discovered by Jacques Cousteau’s expedition in the early 1950s. It was a British transport loaded with war materials for the Africa campaign, sunk by German bombs. Cousteau never revealed the location, so it was undisturbed for 40 years until rediscovered by Israeli divers. Despite its popularity and scores of visitors every day, many of the trucks, motorcycles and guns are still there. Other wrecks in the region are located at Abu Nuhas, the Brothers Islands and Ras Muhammad. In the early 1980s we happened upon a field of more 30 intact amphoras lying in the sand at Fury Shoal. Although the location was kept secret, all were gone within five years. 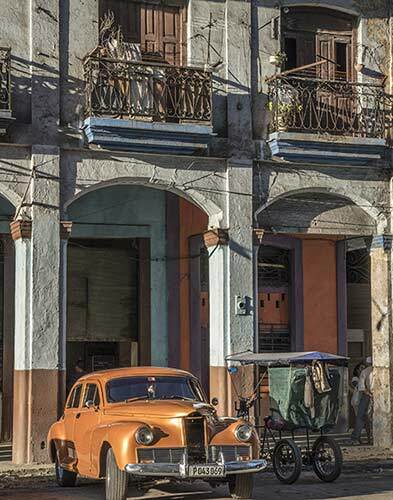 Traveling to Cuba is like stepping back in time about half a century or more. Long a forbidden country for Americans, Cuba is preparing for a tourism onslaught now that relations with the United States have improved. Europeans have been going there all along, but American visitors will increase the pressure exponentially. Americans today can’t go just as tourists, although that may change soon. There has to be an educational or cultural aspect to their visit. That’s a good thing, because it forces American visitors to meet the Cubans. The warmth, ingenuity and resiliency of the people can only be experienced on a person-to-person basis. Cuba is a step back into the 1950s. It’s not only the old American cars, although there are lots of those. Some buildings in Old Havana date back to the 16th century. And because of low diving pressure, areas like Jardines de la Reina are a throwback to Caribbean reefs of a half-century ago. Lots of sharks and big groupers are evidence that there is virtually no fishing pressure. You’d have to swim a long way to find a damaged sea fan or coral. The United States isn’t universally loved around the world. But more often than not, people are eager to meet us and talk about each others’ countries. This was especially true in places like Egypt, Cuba, Papua New Guinea and South Africa. There may be political tensions and warnings of high crime rates, but it’s important to keep things in perspective. I felt safer on the streets of Cairo than I would in certain neighborhoods of San Diego. People sometimes ask, “What’s your secret?” when inquiring about how to safely visit far-flung destinations for diving and topside exploring. There’s no secret, really. Do a bit of research when deciding on a destination, and whenever possible use the services of a veteran dive travel specialist who can direct you to known and trusted local guides at your destination. Invest in trip cancellation insurance and make sure your immunizations are up-to-date. Beyond that, be respectful of local culture, travel with an open mind and be willing to learn. If you can follow these simple suggestions you’ll likely find that encounters with local people can be just as rewarding as encounters beneath the surface. By Eric Hanauer This article was originally printed in the March/April 2016 issue of Dive Training.